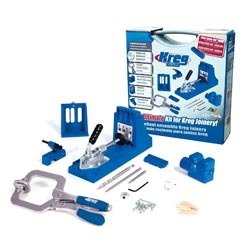 The Kreg Jig Infomercial Master System is Drill Jig is the ultimate tool for joining wood together at 90 degree angles. The patented 3-hole drill guide allows you to make perfectly placed pocket-holes in a wide variety of material widths and thicknesses. It has 1/8-inch incremental settings for materials from 1/2-inch to 1-1/2-inch thick. There is also a dust collection shroud to reduce wood chips. With your help we can reach more people and let them know about Kreg Jig Master System whether this product works or not. I've had it for two years. It does make good, tight joints. The jig makes pockets at the correct angle. The screws are good but a little pricey. But, it works.